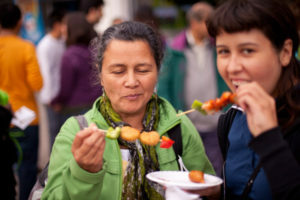 On April 28, 1985, five hundred people gathered at the Kensington Campus of George Brown College (now the Kensington Market Lofts) for the Toronto Vegetarian Association’s first Vegetarian Food Festival. The event featured ten cooking demos led by local chefs and restaurateurs and a screening of The Vegetarian World, a 1982 documentary narrated by William Shatner. Presented by the Toronto Vegetarian Association, the Veg Food Fest is the leading event of its kind in North America and one of the largest vegetarian events in the world. The festival attracts over 40,000 visitors, 130 exhibitors and features over 30 hours of programming including live cooking demonstrations, music, workshops, films and presentations on a variety of topics. The festival has been a launching point for many new products and businesses.